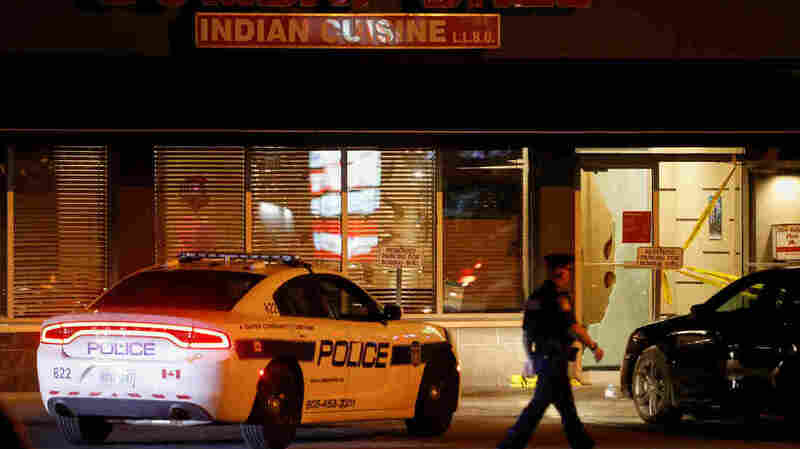 15 Injured, Some Critically, After 2 Men Set Off Bomb At Ontario Restaurant : The Two-Way Police in Ontario say two men walked into an Indian restaurant near Toronto Thursday night and set off an improvised explosive device, then fled. Three people had "critical blast injuries." A police officer walks in front of Bombay Bhel restaurant early Friday, where two unidentified men set off a bomb Thursday night in Mississauga, Ontario. Police said the two suspects fled the scene immediately afterward. The Peel police released a security camera photo showing two men wearing hooded sweatshirts with their faces obscured walking through a doorway. The Peel Regional Paramedic Service said 15 people were taken to a hospital, including three with "critical blast injuries" who were taken to trauma centers. The bombing comes just over a month after a driver plowed a van into a crowd of pedestrians on a busy Toronto street, killing 10 and injuring 15. Mississauga is a city on Lake Ontario and is Canada's sixth-largest city.